Theo Fleury is back. He had a best selling, tell all autobiography back in 2009 (has it been that long already?!) called Playing With Fire. Co-written by the excellent Kirstie McLellan Day, the book was dark, scary and downright uncomfortable at times - expertly capturing the traumatic life Theo Fleury has been forced to endure. Now comes his new book, Conversations with a Rattlesnake: Raw and honest reflections on healing and trauma . Key words here are raw and honest. Expect more sad and shocking news about Theo Fleury's life here. Fleury of course puts these books out to help other victims like him, so that maybe in some small way he can help them. I sincerely hope that one day Fleury can put out a book that sends the message that he has found peace. That could be the best message he can send to other victims. 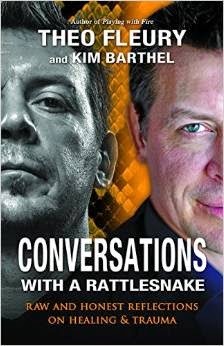 From The Publisher: Following the release of his mind-blowing first book, Playing with Fire, Theo Fleury joins forces with world-renowned therapist Kim Barthel in a new book, Conversations with a Rattlesnake, coming out November 2014. The book is a raw and honest conversation, loaded with personal insights and cutting-edge information about healing from trauma and abuse. Fleury calls Barthel the “Wayne Gretzky of therapy” and within their emotionally safe relationship he bares his soul so that others can learn from his mistakes, triumphs and new learnings. Fleury’s story will inspire not only those overcoming their own trauma but friends, parents, teachers, coaches, therapists and health practitioners—anyone who is in the critical position of supporting someone who needs to share their own story. Co-author Kim Barthel provides an in-depth explanation of early childhood attachment and addiction that ties into the reasoning behind our behaviours and the science of how our brains work. Barthel explains how understanding groundbreaking scientific and psychological research can eliminate the unnecessary and damaging shame that so often accompanies abuse and trauma. Her dialogue with Fleury illuminates self-awareness, mindfulness and the power of relationships. Fleury’s life experiences and Barthel’s informed interpretation combine to provide a unique look at the healing process that is easy to read, entertaining and transformational.